I have been fortunate enough to discover another healthy option that is helping me stick with my diet, while satisfying my cravings for in-between-meals snack foods – Michael Season’s Popped Black Bean Crisps. Michael Season’s set out to provide healthy, additive-free, snacking options. In 1993, he introduced what is now one of the company’s most successful products—Michael Season’s Thin & Crispy Potato Chips. With the health-conscious consumer in mind, Michael Season’s developed his newest tasty creation for guilt-free snacking – Popped Black Bean Crisps. 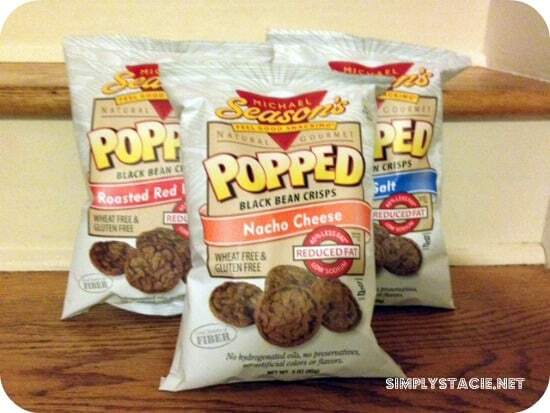 The Popped Black Bean Crisps are reduced fat, low sodium crisps made with all-natural ingredients. They are wheat and gluten free, great for people with dietary restrictions. They currently come in three flavors: Sea Salt, Nacho Cheese and Roasted Red Pepper. My husband and I particularly enjoyed the Sea Salt flavor. The crisps are light and flavorful, and we managed to polish off the entire bag in one sitting – it’s a good thing they are low in calories and fat! The entire bag only had 360 calories and 12 grams of fat, so we had no guilty feeling when we got to the bottom of that bag! The Nacho Cheese and Roasted Red Pepper flavors were equally as delicious as the Sea Salt. I would definitely put these out at a party, or just keep a few bags in the pantry for when my snack food cravings hit! You can learn more about what Michael Season’s has to offer on their website and on Facebook. Use their online store finder to locate a retailer near you that carries Michael Season’s snacks, or buy them online. I would love to try their Honey Barbecue Thin and Crispy potato chips. Ripple, lighly salted potato chips. The Jalapeno Puffs sound delicious! I love sour cream so:Cheddar and sour cream baked potato crisps. White cheddar cheese puffs look great. the honey bbq chips sound delicious! My favorite is the Cheddar & Sour Cream Baked Potato Crisps. I’d love to try the White Cheddar Cheese Puffs. The sea salt and balsamic vinegar kettle chips would be delicious! I like the Salt & Pepper thin and crispy. My favorite product is the White Cheddar Cheese Puffs. Hot Chili Pepper Curls! Yum! I love the Ultimate Puffs & Curls!